The year was 1982, and they knew it was time for action. All three could sense that they could not afford to miss this wave – whatever it cost. The only option was to start again from scratch – turning the company’s world view upside down and doing what no one else had succeeded in doing. They faced an enormous challenge – but they had done it before, so why not again? Three work colleagues have gathered at Weber’s restaurant in Schaumburg, near the outskirts of Chicago. The invention of the Genesis was lead by engineer Erich Schlosser (left), Mike Kempster (middle) and Jim Stephen (right) who at that time were National Sales Manager and Gas Sales Manager, respectively. But they have also been friends for many years. Each carries memories from 30-40 years of service to the barbecue – impressions and experiences which bind them together with an invisible bond. It is a gathering of legends’ when names like Jim Stephen, the son of Weber’s founder, Mike Kempster, who’s Executive Vice President of Weber and Senior Project Engineer Erich Schlosser meet – three men who reinvented barbecuing precisely 30 years ago through a watershed invention. A feat no one had foreseen, and which they had hardly dared to believe possible. It is not just any barbecue that is celebrating 30 years. Weber’s Genesis gas grill series was launched in 1985, and its many innovative and revolutionary features changed the whole perception of what a gas barbecue was, what it could do, and how it should look. Yet although the three men behind the project are proud, they also look back on the time when they were developing Genesis with great humility. “I think it was more or less survival. You could feel the ground shift underneath you so we knew that we had to be in the gas business but we had to be in it in a Weber way where consumers would have a great experience,” says Mike, who was Weber’s National Sales Manager at the time. 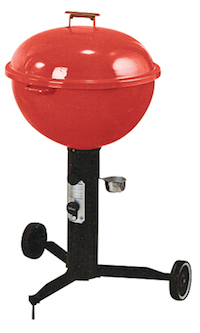 Weber already had a gas barbecue on the market – a gas version of the kettle grill, with which they had been trying to break through for a few years. But it didn’t work very well, and surveys showed that people associated the round shape with charcoal. When people were presented with the gas model, they simply assumed it was a charcoal barbecue. “Weber was a much smaller company back then. The sales were almost all charcoal. 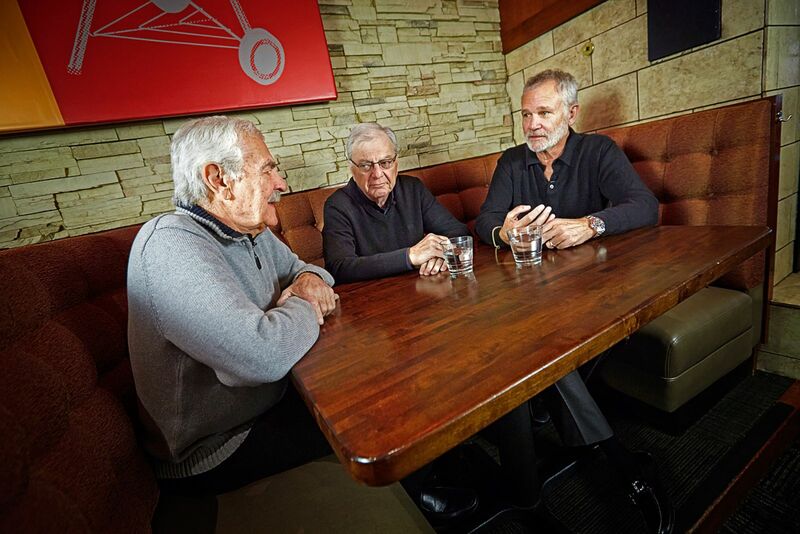 It was Dad’s kettle grill that was carrying the company – the kettle pretty much as it is today,” says Jim, one of the sons of founder George Stephen. At the time, he was head of gas grill sales, and he and Mike could see in the early 80s that the gas barbecue market was storming ahead. Since they did not feel the gas kettle grill was the right solution, something had to happen – and they both knew what they had to do. “We did some research and that told us that consumers really associated a gas grill with a rectangle back then, because that was what the gas barbecue companies were selling in the United States,” Mike explains. But for a company like Weber, throwing their weight behind a square barbecue was no small step. Since George Stephen was renowned for having invented the world’s first kettle grill, the company’s identity was based on the rounded shape. “So I had to go back to Dad and I remember sitting in his office and saying, ‘Hey Dad, we have to come up with a new gas barbecue … and it’s got to be rectangular and it has to have hinges.’ Duck!” Jim recounts, covering his head with his arms to illustrate. “But lo and behold – he looks at me and he says, ‘Oh, if you really think so – why don’t you start working on it then?’”. Mike and Jim allied themselves with Erich, the chief engineer, who at that point comprised the company’s development department, together with a model maker and a draughtsman. He is renowned today as the man behind a number of Weber’s most epoch-making inventions and patents, among which Genesis is a shining example. Thousands of Genesis grills have since been sold around the world, and a number of models are now available. Just as Weber’s modern kettle grills are virtually identical to the original from 1952 – the same is true of Genesis. 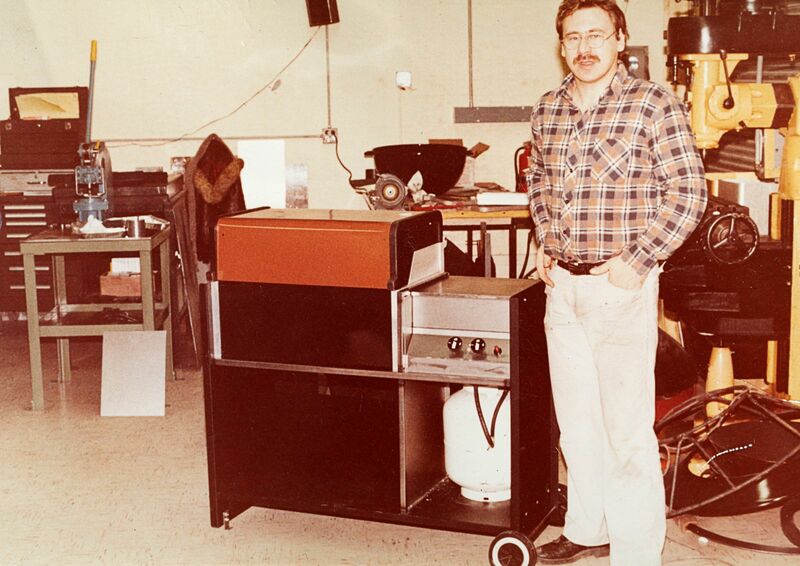 Back in the 1980s development laboratory, Mike, Jim and Erich kickstarted the project by evaluating the other gas barbecues on the market, to provide a basis for comparison. “It slowly dawned on Erich and myself that these things were all flaring up like mad, they were cheaply built – they really had no substance to them. And we realised ‘We’ve got the wrong benchmark here. If we only beat them – it’s not a very high bar’. So we switched so the benchmark we were going for was the kettle. We had to come up with something that would cook as good as Dad’s kettle. That was a breakthrough in my mind,” Jim recalls. While Weber’s kettle grill served as the quality benchmark, they identified the challenges by examining the other gas barbecue brands. Gas grills were a relatively new trend at the time, so there were a number of teething problems the three men intended to avoid. Out in the stores, Mike was everywhere, consulting with customers. It quickly became apparent that all gas grills were delivered as a box full of parts, which people had to assemble themselves from the ground up. “So we started to think, ‘How do we make the out of the box experience better?’ Mike really challenged us, saying ‘Hey, can we have the burners installed inside the box – and the manifold and the gas connections and so on?’ So that became a rallying cry. Then the next was ‘Hey, let’s connect it to gas in the factory and light it and make sure that the ignition works, the valves work properly and all of that.’ And then the next cry was ‘Let’s see if we can put it together with as few bolts as possible.’ Actually the originally Genesis went together with eight bolts and one screw. So it just developed – it wasn’t like we started off by saying ‘This is what we want to do’. We knew that we wanted to do something better than anything else on the market place – because it had to have Weber DNA,” says Jim. In addition to making it easy to assemble the barbecue, they experimented with the shape. The initial prototype was just a box, but something was wrong – it did not look like a Weber. With Genesis, Weber became the first company to introduce colored gas grills – and Erich succeeded in finding a way to produce a stable porcelain-enamel lid – a feature the company’s kettle grills were renowned for. Their research also made it clear that flare-ups and uneven heat were among the biggest challenges in the market. “The competition at that time were rectangular gas barbecues with lava rocks inside and they had a burner that was kind of in the middle so you had uneven heat and cool corners. With the lava rocks consumers would buy a gas grill and they would hate it because it set steaks on fire. So Jim and Erich had the job of figuring out why these flare-ups occurred and how to make our gas grill cook as well as our charcoal grill did – that was the real challenge,” Mike explains. In the development department, Erich produced sketch after sketch, listened to the various inputs and requests from Mike and Jim, and pottered with a wide range of models. The other two dropped in every day – all energy and thoughts were devoted to development of the new gas grill. “Yeah – ‘Let’s make something we can model up and try. Find out if it works,’” says Jim, laughing. By trying out a number of different components and options, thinking creatively and experimenting with alternative solutions, useful ideas began to sporadically emerge. One of the engineers working on the project with the prototype of the Genesis – getting the details right. “I think our challenge was to duplicate our charcoal kettle and its performance with indirect cooking. The method we felt was appropriate for this was the three burner system – having one in the front, one in the back and one in the center to accomplish indirect cooking by leaving that center one off when you cooked. That way heat would be coming from both sides,” Erich recounts. With this in place, it was time to consider flare-ups and the challenge of getting food cooked on a gas grill to taste as good as food on a kettle grill. How would they achieve this? Jim put his trust in the engineer. We will come back to the idea they eventually hit on. But as the inventions and experiments advanced, 1981 became 1982, then 1983, and suddenly 1984 was upon them. “It was a long process. One of the things I was concerned about was to try to time the introduction and to meet the demands of our retail buyers. And of course that was a real challenge because I knew that these two guys had to keep working and working till they were convinced that they had something that would be every bit as good as Jim’s Dad’s kettle. So it wasn’t just something you did overnight,” explains Mike. While intense work was being done on Genesis at home in Palatine, he was busy keeping the dealers at bay – explaining that something exciting was in the works, without giving an exact date. The team was actually forced to delay the launch because they were not ready. “The original date was in 1984 and I remember this vividly. I was at home, asleep, and I woke up around two o’clock in the morning. My heart was pounding and I just leaned over to my wife and said: ‘Honey, I’m gonna go to the factory – I’ll be back in a bit’. So I drove to the factory, went back to the R&D lab, sat there and looked at the Genesis as we had designed it then and I looked at it and said ‘It’s not done’”, Jim recalls. The next day he took a deep breath and raised it with his father, Mike and Erich. As time passed, things began to fall into place in the development department. Eric built and tested various concepts, and then suddenly hit on the idea that ended up resolving many of the challenges. The answer was the Flavorizer Bars – a system that was patented and has since been at the core of Weber’s gas grills. Although the bent metal strips placed above the burners may have a humble appearance, this belies their importance and the innovative leap. “I was analyzing the problem with the lava rocks. I could see that when it was hot, the lava rock gave you the flavor, the vaporization you needed, but on the other hand it kept absorbing all the fat that was then ignited. So I felt like I had to create something that gave you that flavor and got rid of the grease that created fire. My thought was to invent something slippery enough to create vapor and then at the same time let the grease run off and then catch it below so it wouldn’t cause a fire,” Erich explains. The result was a form of bent metal strips which protect the burners from fat, help distribute the heat evenly throughout the grill, and create the small amount of smoke needed to give the food barbecued taste. Test after test was conducted. Each day Jim bought all the New York strips he could get hold of and packed the cooking grates. “I figured that was one of the hardest things to barbecue, because you have this lean chunk of meat but then you have all of that fat, and when the fat starts to really run off – that’s when a barbecue is gonna take off on you. So when Erich showed us the Flavorizers, and we started cooking lots of New York strips without flare-up and the grease tray was filling up with all of this grease below the burners – that’s when I started to think ‘Erich’s onto something,’” says Jim. “It convinced me. We had sausages and hamburgers and then on top of it – New York strips – stuff that was really, really greasy – and it worked,” Mike adds. And therein lay the challenge – how would people react when they were told that these angled bars were responsible for ensuring traditional barbecue flavor? That was why Mike decided the invention should be called Flavorizer Bars – to keep the focus on flavor. “But they got it – and they sure were some gooooood New York strips. Those days we were the heroes of the factory because we couldn’t eat them all,” Jim recalls, as the three break out in smiles. Genesis had begun to take shape, but it was still only the small close-knit team which had seen the grill. “It wasn’t hard to keep it a secret because we were such a small company that most of our competitors didn’t think that we would amount to anything in gas grill sales,” says Mike. George Stephen followed the process from the side lines without getting involved, but being the charcoal man he was, he had a natural scepticism. “Then one day I served Mr. Stephen a steak. Do you guys remember that? He said ‘Now – that’s what I like about a steak – being done on a charcoal grill’. But I had actually cooked it on the Genesis – this was when I felt that this was right. It was a powerful thing for me to hear,” Erich recalls, smiling. “Well, Dad was trusting. Although he didn’t understand what we were doing, he trusted us. Once we got it working, we showed it to him and he smiled a bit and didn’t say that much, but that was expected. But he didn’t say anything bad either, so that was good,” says Jim. As things began to fall into place, Mike named the grill ‘Genesis’, which means creation in Greek. He had a vague feeling that they were on to something big, and that this was the perfect name for the new invention. In 1984, Genesis was ready to be presented to dealers at the McCormick Place, and Mike, in particular was nervous. They had invested a lot in the project – and now it was time to see if it would prevail. “The interesting thing about the whole process was that we didn’t go after a specific retail price. We said ‘We’re gonna make a really great gas barbecue that’s worthy of the Weber name and whatever it sells for – that’s what it sells for,” Mike says. “Not telling that to Dad was probably the smartest thing you did,” laughs Jim. Yet the air was thick with apprehension as it came time for the curtain to fall. An average gas grill cost 100-129 dollars at the time, and Genesis had a retail price of 400 dollars. How would the dealers react? “At the hardware show we’d take them through the story and they were impressed with it. And then we’d come to the ultimate question ‘Well, how much is it gonna sell for?’ and you’d see their face just drop when we’d say 400 dollars. And they’d say ‘Well, I don’t think it will ever sell.’ But they said one other thing: ‘Do you have some sort of special deal where we can get one for ourselves’. So Jim and I looked at each other and we knew that we had something right going on,” Mike says with a grin. This reaction was not very different to the one George Stephen encountered back when he presented the kettle grill, so it would take more than that to alarm the team. They set a goal of selling 36,000 models in the first year, and invested lots of energy and resources in achieving this. A brand-new production line was developed so they could eliminate faults, and a teaser campaign was used to inform consumers that Weber had something square on the drawing board for the 1985 season. They reached the goal – 36,000 units were sold. “And not one of them came back,” Jim adds. After the launch of the Genesis in 1985 it was all about letting people know through ads, demos etc. that the square shaped barbecue was in fact a Weber. It is 30 years since the first of countless Genesis grills began to be shipped from the factory in Palatine. There have been minor adjustments along the way and the look has been updated, but inside it’s the same revolutionary Flavorizer Bars, grease collection system, three burners and other inventions from the early 1980s that drive one of the world’s most loved gas barbecue series. Weber has also expanded its gas grill range by adding the Summit, Spirit and Weber Q series, which all have roots in Genesis, one way or another. The three co-developers are clearly proud of their achievement – Genesis is the bright light as they look back on their long careers. “We weren’t just betting the company on it – we were betting it on it. But I think the greatest pride for me is the faith Dad put into us, allowing us to change everything and create the Genesis – when he didn’t have the money. He DIDN’T have the money, but he found a way to fund us, realizing that it would really change the trajectory of Weber. So if there had been no Genesis, Weber would have been this great little charcoal barbecue company tucked in behind the railroad tracks in Palatine, Illinois,” adds Jim. 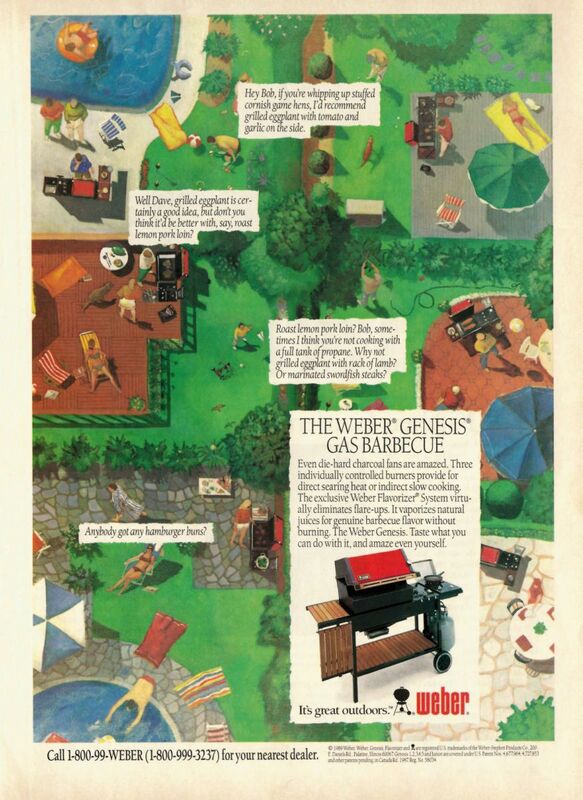 Genesis ushered Weber into a new era – in which the shape could be either round or square, and their factories produced both gas and charcoal barbecues. And it set new standards for what a gas grill could do and should be. “Now we’re on the path to really becoming a global company. We’re not there yet but we’re getting there. And it wouldn’t have happened without the Genesis. So it did change Weber and the perspective of gas grilling. And you don’t get many events like those in your business life,” says Jim with a smile.